Dr. Lorenzo Candelaria doesn’t live or work where he did 12 years ago, but the former Diverse Emerging Scholar has remained passionate about arts education and its potential to reach and inspire underrepresented students. When Candelaria was part of the Emerging Scholars class of 2007, he was an assistant professor of musicology at the University of Texas at Austin. In 2008, he was awarded the prestigious Robert M. Stevenson Prize for outstanding scholarship on the music of Spain and Mexico. Candelaria earned tenure at UT Austin and eventually joined the faculty at the UT campus in El Paso, where he was born. 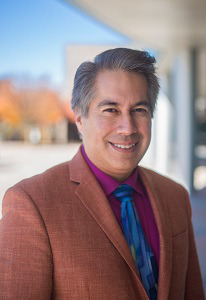 He later was appointed associate provost at the nationally recognized Hispanic Serving Institution, where he worked to position the arts in cross-disciplinary environments campus-wide. Now, as professor of music and dean of the School of the Arts at Purchase College in the State University of New York system, Candelaria is continuing his mission as an advocate for the arts “as a means of effecting social mobility, of building inclusive communities and of inspiring our better selves,” he says. “The opportunity was too good to pass up,” says Candelaria, pointing to Purchase’s internationally acclaimed conservatories and the access provided to the first-generation students and other underrepresented groups he’s committed to reaching and serving. Since arriving there last summer, Candelaria, 47, has made arts advocacy his school’s cause. His teaching, scholarship and community engagement seek to shape and drive “a national conversation on the central role of the arts in society” with “humanities-infused public programming” playing a vital role, he says. “Socio-economic mobility was effected through the arts – the very arts that our society now considers too Western, too White, too male, too elitist and too distracting to a meaningful public education. Nonsense. My life bears witness and I am just one of many,” he says. One of Candelaria’s priorities is to use the arts to build a pathway to higher education, particularly for first-generation students and other underrepresented groups. He has initiated a program called “Paths to Purchase” that works with arts schools in New York City, primarily in Brooklyn, Queens and the Bronx. It engages high school sophomores, juniors and seniors with arts programming aimed at improving their chances of attending and graduating from college. Colleagues at Purchase welcome what Candelaria brings to the school, including “a fresh vision,” says Dr. Jennifer Undercofler, director of the Conservatory of Music. Candelaria’s commitment to total inclusiveness at every level of higher education is demonstrated by his passionate efforts to weave diversity into an institution’s culture, rather than treating it as a box to check on an administrative to-do list, says Jennifer Shingelo, the School of Arts’ assistant dean of students and enrollment. Candelaria has brought renowned classical musician and author Joseph Horowitz to Purchase to teach a course this term titled “Music, Culture, and Ideas.” Meanwhile, he has two books in progress and is an in-demand speaker on topics such as mariachi music, plainchant, arts education and the 21st-century demographic. Dr. Robert Freeman, retired former president of the New England Conservatory and former dean at UT Austin, has known Candelaria since hiring him at UT Austin. He described Candelaria as a visionary leader who is rare as both a first-rate scholar and a first-rate musician. Freeman still believes a hunch he got when he first interviewed Candelaria and was impressed by his talent, intellect and communication skills. This article appeared in the January 24, 2019 edition of Diverse.